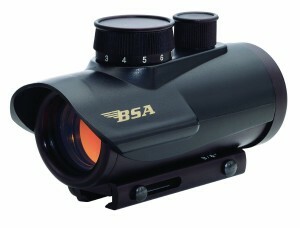 Welcome to our review of the BSA 30mm Red Dot Scope (amazon.com link). 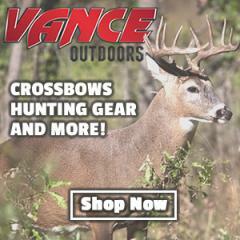 The scope is designed for handguns, rimfire, rifles, shotguns, pistols, black powder muzzle loaders, and crossbows, and features a 5 MOA center dot. Power is supplied by a CR2032 3-volt lithium battery, and is easily changed when the battery is depleted. The brightness is adjustable to 11 different settings, allowing you to set the brightness of the dot dependent on the light conditions you are shooting under. This is a simple red dot scope, and does not offer any magnification. Magnification is 1X, which is typical for red dot scopes. The optics quality for me was quite good. The objective stayed clear through all of my testing, and the red dot was crisp and clear and very accurately placed for short to medium-range shooting. The only time the dot was ever out of focus, simply turning down the brightness setting cleared it right up without a problem. This is an illuminated sight, and has very good light gathering capabilities. I was able to hunt with it on my pistol and my crossbow during the early morning hours without any problems. It performed flawlessly, and the adjustable brightness settings are diverse enough to make it easy to adjust for various light conditions. The biggest drawback to this scope is that the red dot has to be set at the highest brightness setting for daytime shooting, which drains the battery quite rapidly. I ran through the battery in an afternoon of shooting, and had to replace it before I went hunting. Since the scope doesn’t have any magnification and is 30mm wide, the field of view is pretty good. You will be able to see a 68’ area from 100 yards, and even better at closer ranges. The parallax setting on the scope is at 50 yards, quite reasonable for this scope. I was able to easily sight in on a deer using this scope, and bring that deer down with a single shot. The BSA Red Dot scope comes with a 5/8-3/8 adjustable mounting system, allowing it to be easily mounted to just about any size rail you might have. Unfortunately, the screws in the mount have a tendency to strip after a while, and I quickly replaced them with after-market screws. How Easy Was It to Sight In? 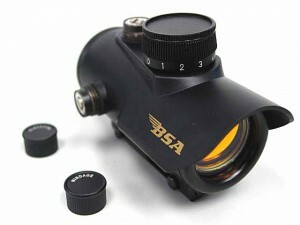 Sighting in the 30mm BSA Red Dot scope was amazingly easy, and the scope has held true ever since. I actually bought two of these, one for my pistol and one for my crossbow, and both of them have remained zeroed in since I first sighted them. The elevation and windage adjustment dials are easy to use, and it only took 15-20 minutes to have the scope perfectly sighted in. Where can I get new rail screws?